Apart from B.Des and M.Des programmes, candidates can also pursue Graduate Diploma Programme in Design (GDPD) at National Institute of Design. Aspirants can pursue GDPD course at NID Vijayawada and NID Kurukshetra campus. M.Des. shall be offered at NID’s campuses in Ahmedabad, Bengaluru and Gandhinagar and B.Des. the program shall be offered only at NID Ahmedabad. 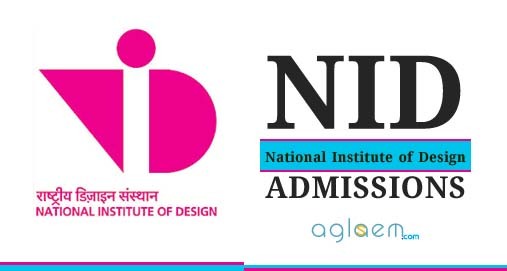 Check complete details of NID Design Aptitude Test 2019 in the article below. Latest: The date of submitting the application form and availability of window to edit the application form for NID DAT 2019 has been revised. Check the same below. The dates for NID Design Aptitude Test 2019 are as follows. July 1995 are eligible to apply for admission. eligible to apply for admission. July 1998 are eligible to apply for admission. education such as CBSE, IB, ICSE or their equivalent. July 1985 are eligible to apply for admission. July 1988 are eligible to apply for admission. Studio Test: This may consist of tests in different formats such as drawing/sketching, hands-on model making, group discussions etc. Total marks of the test will be out of 100 and the duration will be of three hours. The DAT Mains will be conducted in English. Candidates need to fill their NID Design Aptitude Test 2019 application form on the NID’s official website. To successfully fill the application form, candidates need to first fill the application form online after which they will be required to upload their supporting documents, signature, and photograph. Aspirants who will be applying for admission at NID under any reserved category need to submit the below-mentioned documents in JPG format. The file size of these documents should not be more than 150 KB. Candidates can pay the application fee via Online (by Credit Card/ Debit Card) or by Demand Draft. If paying the fee by DD take a printout of their NID Entrance Exam 2019 application form and thereafter send it along with the DD. Also, aspirants need to fill all the details regarding their DD in their online application form. As per last year, the amount of application fee for DAT – B.Des /GDPD and DAT – M.Des is mentioned below. If there will be any changes in the application fee it will be updated here. 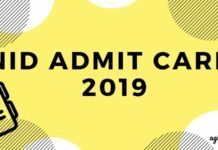 The NID DAT 2019 Admit Cards will be available for download on the NID website (www.admissions.nid.edu) as per the schedule. It is solely the responsibility of all candidates to download and print their own respective Admit Cards. Candidates need to bring the admit card to appear for the entrance test. Firstly, the admit card will be issued for Design Aptitude Test (Prelims). Based on the scores obtained in the DAT Prelims, eligible candidates will have to appear for Design Aptitude Test (Mains). The admit card for DAT Mains will be issued for only shortlisted candidates. OMR sheet and evaluated digitally. appear for the DAT Mains exam as per the schedule announced. Separate merit list will be prepared for Overseas candidates. Click here to view/download Sample Paper for B.Des./GDPD. Click here to view/download Sample Paper for M.Des. DAT Mains for B.Des./GDPD: Based on the scores obtained in the DAT Prelims, eligible candidates will have to appear for the DAT Mains. The Admit Card for shortlisted candidates will be available for download only on the official NID admissions website (www.admissions.nid.edu). The test center will be at Ahmedabad. therefore, the candidates must arrange accommodation at their cost. DAT Mains for MDes Admissions: Based on the scores obtained in the DAT Prelims, eligible candidates will have to appear for the DAT Mains. The Admit Card for shortlisted candidates will be available for download only on the official NID admissions website (www.admissions.nid.edu). National Institute of Design announces the result for NID DAT, candidates who will be shortlisted in this round will need to further appear for NID DAT (Mains). Candidates can check their result for NID entrance exam on the official website of the exam by providing details such as email address, date of birth, roll number/application number etc. Candidates who will appear for NID DAT (Mains) wherein authorities will conduct a Studio Test and Interview round at NID campuses. National Institute of Design (NID) will release the Question Papers & Answer Keys of the prelims exam after the successful completion of the exam which will be held in January, 2019. Candidates will be able to check the same by login through their Email Id, Date of Birth, Application Form No. & Verification Code. The direct link to check the same will be provided below. Click Here to check the Last Year B.Des Final Answer Key. Click Here to check the Last Year M.Des Final Answer Key. Login Here to check the NID DAT 2018 Question Papers & Answer Keys. Insofar, official details of NID Admission 2019 have not been announced. Information on this page is as per last year brochure and for reference purpose only. 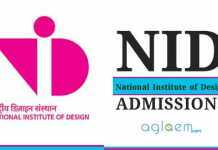 As soon as NID releases NID Admission 2019 information brochure, details will be updated here.